Oversized 9" x 12" format. Includes a pictorial featuring John Holmes as Superman, and a one-page article on Devo. Magazine is Near Mint Minus save for date "11-5" written on upper left cover. Includes an article by Abbie Hoffman. interview with Edith Pink Flamingos Massey. Includes a comic strip by Bill Plympton. 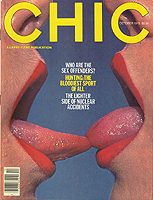 Includes an interview with adult filmmaker Cecil Howard. Includes interviews w/ Terry "Monty Python" Gilliam and Gunnar Texas Chainsaw Massacre Hansen. Also includes a pictorial of Lisa de Leeuw and John Holmes.